Lifestream Natural Calcium for your bones, teeth and nails. Calcium is used by almost every cell in the body including the heart and nerves. It is an important component of a healthy diet. Although we imagine our bones are permanent, they are actually being constantly renewed throughout our life and replaced with new bone tissue. In fact, our entire skeleton is renewed approximately every seven years. Calcium is one of the most essential and important minerals needed by our body. Getting enough calcium from your diet everyday is vital to build strong bones, healthy nails and teeth and to maintain bone strength and density in later life. If we do not consume enough calcium in our diet, our body takes necessary calcium from our bones to use for other essential functions. It is important to ensure that the body can utilise and absorb the calcium it is given. Natural food-complexed calcium may be the most suitable form of calcium for long-term use. Usually good sources of minerals are obtained from natural plant and vegetable foods however calcium content is high in only a select number of foods. 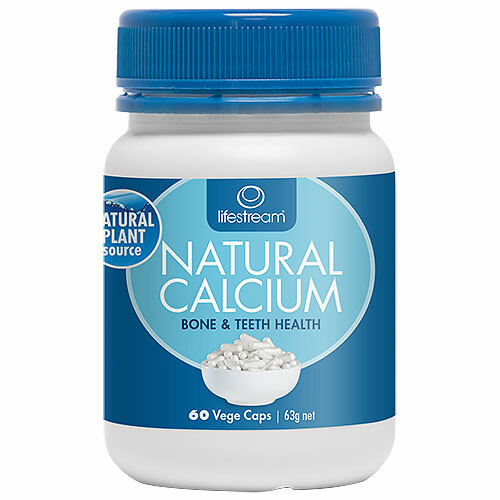 Lifestream Natural Calcium is made from a natural sea vegetable called Lithothamnium Calcereum and contains no hydroxyapatite (crushed cow bones), no limestone or chalk, no artificial or added preservatives and no animal products or by-products. It has a natural calcium/magnesium ratio of 10:1 just like Mother`s breast milk and cow`s milk. Lifestream Natural Calcium has a unique porous `honeycomb-like` structure which works particularly well in the digestive system and gives it extraordinary absorption properties. The molecules in Lifestream Natural Calcium have a very large surface area which allows faster solubilisation, more reactive surfaces and rapid ionisation of the calcium giving superior availability to the body. It also naturally contains co-factors magnesium, boron, selenium, phosphorus, zinc, copper and iodine in a perfect natural mix from Mother Nature. A complete and natural calcium food. Lithothamnium calcareum sea vegetable, Vegetarian capsule (hypromellose and water), cornstarch, vegetable magnesium stearate, silica. Adults:Take 1 to 3 caps (900mg - 2.7g) daily. Children 6-12 years: Take 1 cap (900mg) daily. Do not use if cap seal is missing or broken. Should not be used instead of a varied and healthy lifestyle and diet. Below are reviews of Lifestream Natural Calcium - 60 Capsules by bodykind customers. If you have tried this product we'd love to hear what you think so please leave a review. Calcium is an important component of a healthy diet. It is used by almost every cell in the body including the heart and nerves.